When you get the new gasket, it’ll come in a box, all twisted up with wrinkles and puckers. If you were to just install the gasket as it is right outta the box, you’d have more gaps in the final gasket seal than Clinton’s memory during the Lewinsky deposition. 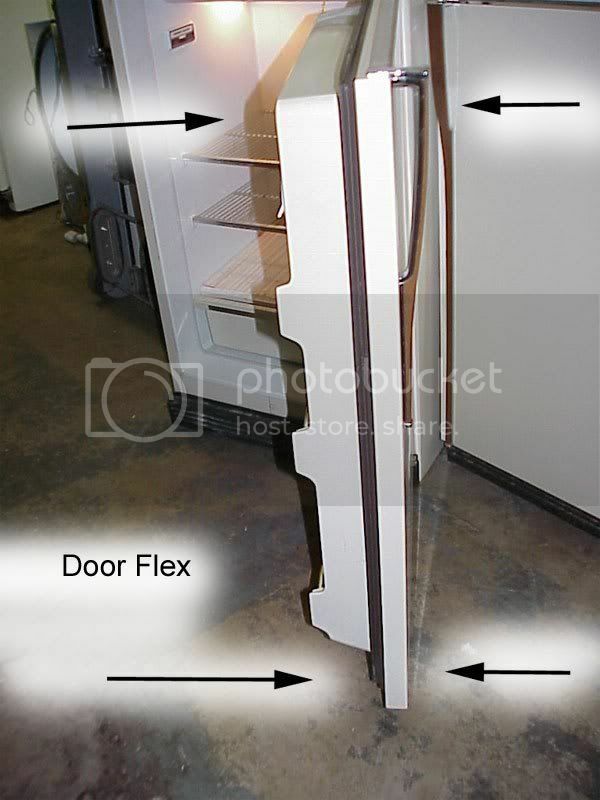 A puckered or wrinkled door gasket makes a cruddy seal with the refrigerator cabinet and will cause lots of condensate and temperature control problems inside your fridge. Stick that sucker in the dryer on medium heat for about 10 minutes. That’ll give you enough time to do some prep work on the fridge door. First thing you gotta do is take all the food off the door shelves. If’n you don’t, you’ll probably have a hard time making door square up right with the cabinet when you’re all done. Next, loosen all them billion and a half retaining screws all around the perimeter of the door. 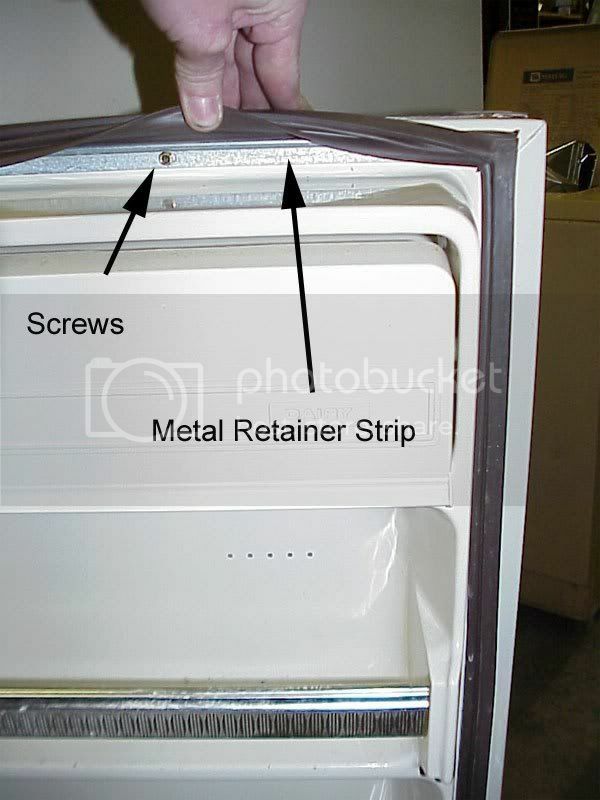 Your gasket may have a metal strip retainer as shown here or it may be the non-retainer style gasket and just tuck behind the inner door liner. Either way, you’re gonna have to loosen all those ¼” screws. One of those Versapak screw drivers with a long ¼” nutdriver attachment takes away alot of the drudgery here. Don’t take the screws out all the way, just back ’em out about 2 full turns. Then pull the old gasket out all the way around. Now, here’s the finesse part. Some of these doors get really floppy when all the retaining are loosened. Start tightening the new gasket from the top working down to the bottom of the door. Periodically, close the door against the cabinet to make sure it ain’t warped, like what’s shown here. If it does seem to be warping on you, just hold the bottom half with your leg and warp it back into place. 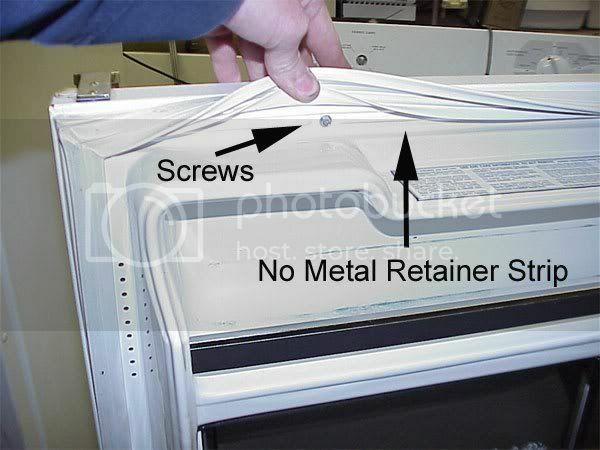 On some older refrigerators, the original gaskets are no longer made and you have to buy a universal gasket kit for the door. These kits will have four sections each with welded corners and you cut the straight sections to fit the dimensions of your door. Just keep one simple rule in mind: all corners have to have welded corners–you can’t just take a straight section and bend it around the corner. Once you got it looking right, go ahead and tighten the retaining screws. I like to put a little silicone lube along the surface of the gasket that’s next to the door hinge so it don’t squeak s’damn much. 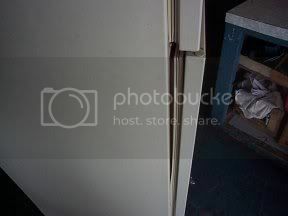 This entry was posted in Refrigerator Repair on September 5, 2004 by Samurai Appliance Repair Man. 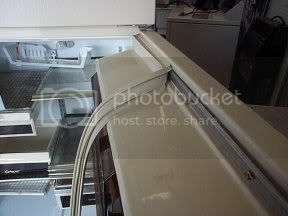 I have a 25 cu ft Amana side by side refrig and freezer. Water drips on the floor under the door of the freezer compartment. The gasket looks ok and the door appears to be aligned. Can I stuff the empty space behind the gasket with weatherstrip foam to keep the door from getting cold and causing condensate outside?